From pop music to hymns, cookies to faith, a self-proclaimed Catholic Ninja brought his message of the church and evangelization to a captivated audience of more than 1,000 STAR Catholic students. Held March 2 at the Leduc Recreation Centre, singer, songwriter, guitarist and story-teller Jesse Manibusan addressed grades 7 to 12 Catholic school students from Leduc, Drayton Valley, Lacombe, Wetaskiwin and Ponoka in STAR Catholic’s inaugural STAR LIGHT Day. “Evangelization is just being alive in the world and creating energy and creating excitement, creating life, creating joy. It doesn’t necessarily mean that you are religious, super religious or super pious,” Manibusan told those gathered, adding it’s something you do every day, bringing excitement and joy. 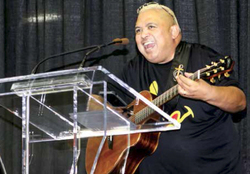 Manibusan shared stories and song with the students, not only exploring their faith but with a mix of hymns and rock, rap and country he related to the students from pop culture to peer pressure. “Who’s the church?” Manibusan asked. “We are,” responded the students. “We have been given this life that you and I have this opportunity to be connected to faith, to be part of an institution that seeks to become better versions of themselves, to be part of the Catholic community, to be part of the Christian community, to be part of the faith community,” said Manibusan. The LIGHT in STAR LIGHT stands for Learn, Ignite, Grow, Help, and Tell. The theme of STAR LIGHT 2015 follows STAR Catholic’s year-long theme: “Alive in Faith.” Students were encouraged to think about and grow in their faith. “Jesse’s talent coupled with his ability to relate to youth helped him deliver the message ‘Alive in Faith’ in a way that our students responded well to. It was a great day,” said Monique Tellier-Phillips, Christ the King School principal. Manibusan’s mission as a faith-based story teller is to affirm and inspire, encourage and empower, while making a positive difference in the lives of young and old, in and out of the Church. “Jesse was an excellent presenter, who really connected with our students with humour and talent to share his faith with all of us present. He was a great person to have start a tradition of STAR LIGHT Day in our Division and we look forward to the event’s continued success in years to come,” said Dr. Troy Davies, Superintendent of Schools. STAR LIGHT Day is an event the division plans on hosting annually as a way to bring its school community together to celebrate faith. “The students were very responsive to Jesse and were openly sharing their faith, what it means to them and what it means to their lives in school and at home. STAR LIGHT Day was a tremendous way to allow the students to come together and celebrate as one faith community,” said Clare Ganton, Acting Director of Faith Life and Religious Education. Pictured: Singer, songwriter, guitarist and story-teller Jesse Manibusan addressed grades 7 to 12 Catholic school students from Leduc, Drayton Valley, Lacombe, Wetaskiwin and Ponoka in STAR Catholic’s inaugural STAR LIGHT Day, March 2 at the Leduc Recreation Centre.